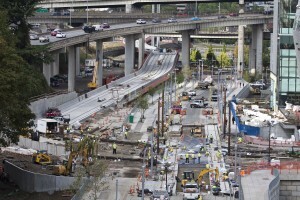 Portland-Milwaukie Light Rail construction on SW Moody Ave completed ahead of schedule. Photo from work underway Sept. 26. SW Moody Avenue has reopened to all vehicle traffic, 8 hours ahead of schedule. Construction crews for the Portland-Milwaukie Light Rail Transit Project have completed light rail installation across SW Moody Avenue in South Waterfront eight hours ahead of schedule. The round-the-clock construction over the past 2.5 weeks involved tying existing Portland Streetcar tracks in with the light rail tracks. 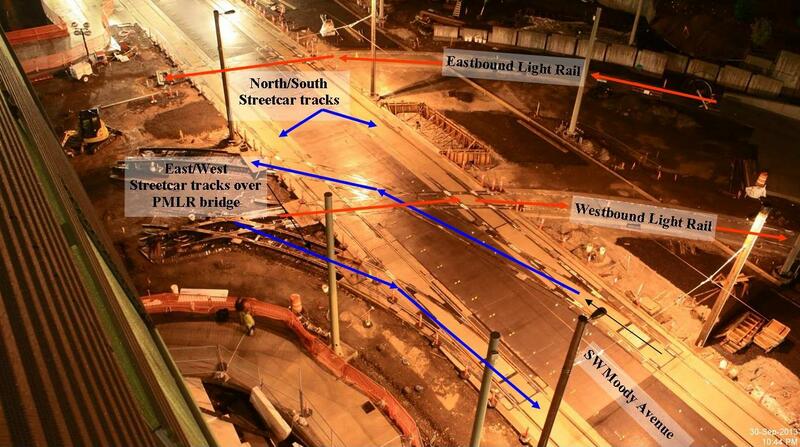 The work began on Sept. 12 and was schedule to be complete by 12:01 a.m., Tuesday, Oct. 1. 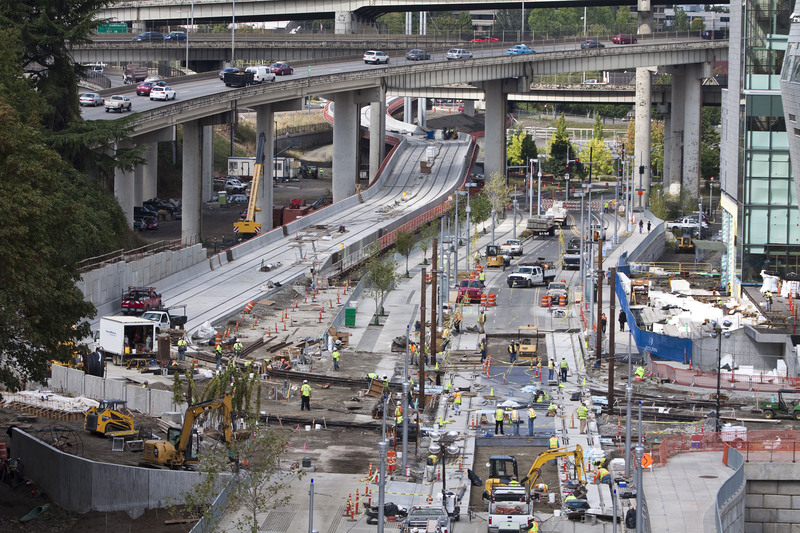 This track crossing will allow transit riders to make quick connections between the South Waterfront/SW Moody Ave MAX Station and the adjacent Portland Streetcar stop on Moody. The new track also includes rail that will carry Portland Streetcar to and from the Portland-Milwaukie Light Rail Bridge, allowing the Central Loop line to travel a full circle in Portland’s Central Business District by crossing the Broadway Bridge to the north, and the new transit bridge to the south. The west sidewalk of Moody Avenue south of Sheridan Street and north of Gibbs Street remains closed until October 18, and pedestrians and bicyclists are directed to the east sidewalk on Moody Avenue. The east sidewalk detour curves around the construction zone, so all pedestrians and bicyclists are encouraged to travel slowly through the area. · The first of its kind multi-modal bridge that will carry light rail, buses, bikes, pedestrians and a future Portland Streetcar extension, but no private vehicles.